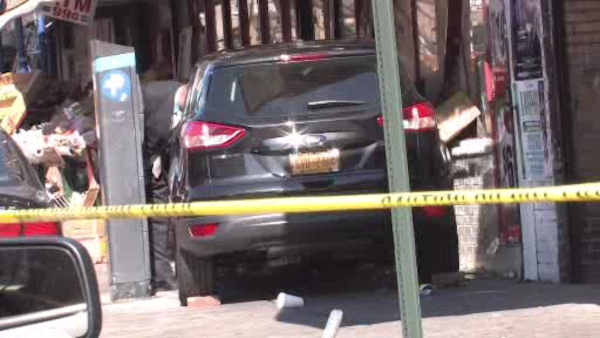 MOUNT HOPE (WABC) -- A man is facing multiple charges, including DWI, after crashing into a fruit stand in the Bronx, leaving a woman pinned underneath his car. Surveillance images showed the moment of impact and the rush to help the woman, after 68-year old Peter Nsoanya lost control of his car and jumped the curb in the Mount Hope section. The woman remains in critical condition, but she is expected to survive. People rushed to help after the crash at about 8:30 Saturday morning, which left the victim buried under the car and crates. Another person was struck but not seriously injured.